Toy cars are cool. But you know what would have been cooler? If these were die-cast versions of the cars *as they appear on the GPK cards*, rather than just regular cars. If these cars were to be removed from their packaging, it seems like you would have no way of knowing they were connected to GPK at all. Has anyone made die-cast toys of car-related GPKs before? If not, they should. I would love a die-cast toy of Rusty Heap. Or imagine one of Travellin' Travis, with the flattened kid wrapped around the tire! That would be awesome. I would buy EVERY SINGLE ONE of these if they were done like the old Weird-Ohs model kits (but die-cast cars, not model kits) or more recently like the Monster 500 toy cars... But if these are just going to be Hot Wheels cars with goofy decals on them, well... then... I'll probably still get ONE, but just ONE and that's it! HA take that! I completely agree with you. I like Hot Wheels-style cars just fine, but I see this as a wasted opportunity. There really isn't anything special about a regular, die-cast car that just has a GPK sticker on it. But if these were like you say, in the vein of Weird-Ohs, but with GPK characters? Holy crap, I'd buy them all! How do we feel about GPK cars that transform into GPK-bots? I'm not sure about that. I think I'd want something more true to the spirit of GPKs. Plus I wasn't ever really into Transformers. I think I asked for some one Christmas and my parents bought me Go-Bots instead. And that was the end of that. Haha yeah I'm just seeing how much milk we can squeeze out of this brand. I think Topps should try to get back into the mini-figure game, with things like Grossery Gang/Trash Pack, the newISH Madballs, Smashers (Gross series), and Flush Force being so popular (and GROSS). They could do little blind bag garbage cans! I mean they'd be like the fifth mini-figure line to do that, but but come on. Agreed. My 9yo loves all that s**t. Topps is missing out on a pretty large market. I am 150% with you on this!!! 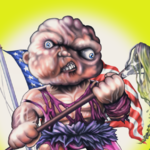 I'm hoping we get some cool new GPK stuff now that there's a new brand manager. They just put out a coloring book which I like (though opinion is divided here on the UG). If they ever release art prints I will give them all the money. I like the coloring book too! And I'm sure I'll still buy the cars just because I'm a car person but they really should have brought them to life with the cars on the cards like you said. We will definitely be buying the cars. Cool idea. – 54010-F: 1:64 Garbage Pail Kids Series 1 – Clutch Clint – 2012 Dodge Challenger"
These are all GPKs from 2016 or later, I believe. So no OS or even ANS characters in this series. And the Post Al GPK is a mailBOX, isn't it? I'll grab a few and jump on them.